There is nothing like a boy and his duck. Just check in with five-year-old Kolton Platt. 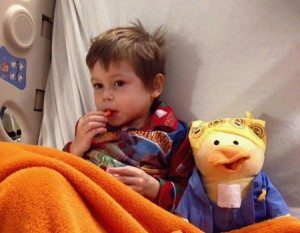 Kolton and his Chemo Duck are inseparable, said his mom Amber Sanders Platt. “When we went to have his port put in, a child life advocate came in before he left for surgery,” said Amber. “She showed him the Chemo Duck before he left for the procedure and told him it would be waiting for him when he woke up. 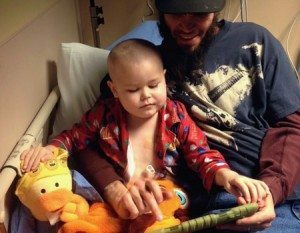 Kolton, diagnosed on Dec. 8, 2015 recently completed his first round of chemotherapy for T-cell all at Rocky Mountain Children’s Hospital in Denver. Chemo Duck has been a great help since his cancer journey began. Kolton named his new friend Jumpy and doesn’t go far without him. Chemo Duck not only soothes Kolton, but has also provided some smiles for his parents, Amber and Jonathan.